One reason is that flat landscapes can unlock new movement patterns in the quantum world of atoms and electrons. For instance, shedding the third dimension enables an entirely new class of particles to emerge—particles that that don’t fit neatly into the two classes, bosons and fermions, provided by nature. These new particles, known as anyons, change in novel ways when they swap places, a feat that could one day power a special breed of quantum computer. But anyons and the conditions that produce them have been exceedingly hard to spot in experiments. 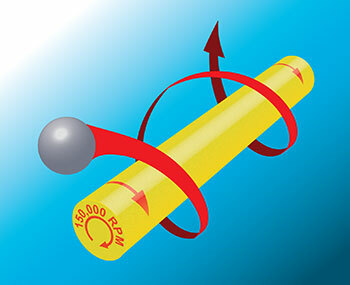 In a pair of papers published this week in Physical Review Letters, JQI Fellow Alexey Gorshkov and several collaborators proposed new ways of studying this unusual flat physics, suggesting that small numbers of constrained atoms could act as stand-ins for the finicky electrons first predicted to exhibit low-dimensional quirks. In the first paper, which was selected as an Editors’ Suggestion, Gorshkov and colleagues proposed looking for a new experimental signature of anyons—one that might be visible in a small collection of atoms hopping around in a 1-D grid. Previous work suggested that such systems might simulate the swapping behavior of anyons, but researchers only knew of ways to spot the effects at extremely cold temperatures. Instead, Fangli Liu, a graduate student at JQI, along with Gorshkov and other collaborators, found a way to detect the presence of anyons without needing such frigid climes. Ordinarily, atoms spread out symmetrically over time in a 1-D grid, but anyons will generally favor the left over the right or vice versa. The researchers argued that straightforward changes to the laser used to create the grid would make the atoms hop less like themselves and more like anyons. By measuring the way that the number of atoms at different locations changes over time, it would then be possible to spot the asymmetry expected from anyons. Furthermore, adjusting the laser would make it easy to switch the favored direction in the experiment. In the second paper, Gorshkov and a separate group of collaborators found theoretical evidence for a new state of matter closely related to a Laughlin liquid, the prototypical example of a substance with topological order. In a Laughlin liquid, particles—originally electrons—find elaborate ways of avoiding one another, leading to the emergence of anyons that carry only a fraction of the electric charge held by an electron. Although fractional charges have been observed in experiments with electrons, many of their other predicted properties have remained unmeasurable. This makes it hard to search for other interesting behavior or to study Laughlin liquids more closely. Grass, Gorshkov and their colleagues suggested a way to manipulate the interactions between a handful of atoms and discovered a new state of matter that mixes characteristics of the Laughlin liquid and a less exotic crystal phase. The atoms in this new state avoid one another in a similar way as electrons in a Laughlin liquid, and they also fall into a regular pattern like in a crystal—albeit in a strange way, with only half of an atom occupying each crystal site. It’s a unique mix of crystal symmetry and more complex topological order—a combination that has received little prior study. Microelectronic devices – from pacemakers to cellphones – have long shaped the course of human health and telecommunications. But, scientists have struggled to navigate the technology gap between microelectronics and the biological world. For example, today’s consumers cannot tap into their smartphones to uncover information about an infection or illness affecting their body, nor can they use their phones to signal a device to administer an antibiotic or drug. One of the primary reasons for this disconnect between the body and everyday technology is that microelectronic devices process information using materials such as silicon, gold, or chemicals, and an energy source that provides electrons; but, free electrons do not exist in biology. As such, scientists encounter a major roadblock in their efforts to bridge the gap between biological systems and microelectronics. But, engineers at the University of Maryland’s A. James Clark School of Engineering, along with researchers from the University of Nebraska-Lincoln and the U.S. Army Research Laboratory, may have found a loophole. By engineering cells with synthetic biology components, the research team has experimentally demonstrated a proof-of-concept device enabling robust and reliable information exchanges between electrical and biological (molecular) domains. Building on their progress, the research team is now working to develop a novel biological memory device that can be written to and read from via either biological and/or electronic means. Such a device would function like a thumb drive or SD card, using molecular signals to store key information, and would require almost no energy. Inside the body, these devices would serve the same purpose – except, instead of merely storing data, they could be used to control biological behaviors. The collaborative research team will work to integrate subsystems and create biohybrid circuits to develop an electronically controlled device for the body that interprets molecular information, computes desired outcomes, and electronically actuates cells to signal and control biological populations. The hope is that such a system could seek out and destroy a bacterial pathogen by recognizing its secreted signaling molecules and synthesizing a pathogen-specific toxin. In this way, the group will, for the first time, explore electronic control of complex biological behaviors. This year, the group was awarded a $1.5 million National Science Foundation grant through the Semiconductor Synthetic Biology for Information Processing and Storage technologies (SemiSynBio) program. Their earlier related work was published in Nature Communications. Read about related microbiology research at Maryland. The above post is reprinted from materials provided byUniversity of Maryland. Note: Materials may be edited for content and length. Extremely small batteries built inside nanopores show that properly scaled structures can use the full theoretical capacity of the charge storage material. The batteries are part of assessing the basics of ion and electron transport in nanostructures for energy storage. 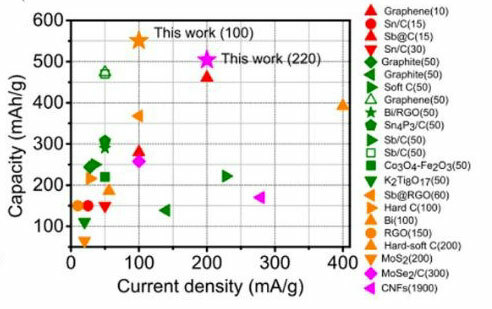 These nanobatteries delivered their stored energy efficiently at high power (fast charge and discharge) and for extended cycling. Precise structures can be constructed to assess the fundamentals of ion and electron transport in nanostructures for energy storage and to test the limits of three-dimensional nanobattery technologies. Nanostructured batteries, when properly designed and built, offer promise for delivering their energy at much higher power and longer life than conventional technology. To retain high energy density, nanostructures (such as nanowires) must be arranged as dense “nanostructure forests,” producing three-dimensional nanogeometries in which ions and electrons can rapidly move. Researchers have built arrays of nanobatteries inside billions of ordered, identical nanopores in an alumina template to determine how well ions and electrons can do their job in such ultrasmall environments. Complete nanobatteries are formed in each nanopore of a dense nanopore array (2 billion per square centimeter), using atomic layer deposition to carefully control thickness and length of multilayer concentric nanotubes, which serve as electrodes at each end. The nanobatteries were fabricated by atomic layer deposition to make oxide nanotubes for ion storage inside metal nanotubes for electron transport, all inside each end of the nanopores. The tiny nanobatteries work extremely well: they can transfer half their energy in just a 30 second charge or discharge time, and they lose only a few percent of their energy storage capacity after 1000 cycles. Researchers attribute this performance to rational design and well-controlled fabrication of nanotubular electrodes to accommodate ion motion in and out and close contact between the thin nested tubes to ensure fast transport for both ions and electrons. This work was performed at the University of Maryland and was supported by the Nanostructures for Electrical Energy Storage (NEES) Center, an Energy Frontier Research Center funded by the DOE Office of Science, Office of Basic Energy Sciences. The above post is reprinted from materials provided by Department of Energy, Office of Science. Note: Materials may be edited for content and length. 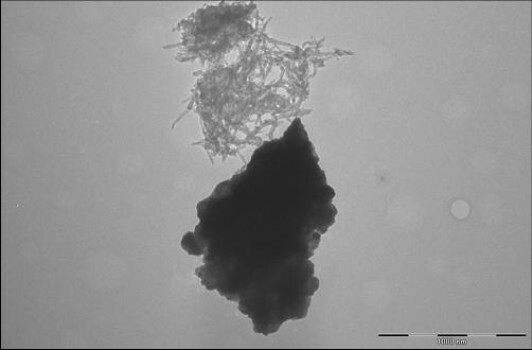 Figure 1a shows lithium manganese nickel oxide and carbon nanotubes clumping separately, with no specific interactions. However, when a multifunctional binding peptide is added to the mixture, as shown in Figure 1b, the peptide binds the dispersed carbon nanotubes to lithium manganese nickel oxide particles. Researchers have isolated a peptide, a type of biological molecule, which binds strongly to lithium manganese nickel oxide (LMNO), a material that can be used to make the cathode in high performance batteries. The peptide can latch onto nanosized particles of LMNO and connect them to conductive components of a battery electrode, improving the potential power and stability of the electrode. Scientists are using biology to improve the properties of lithium ion batteries. 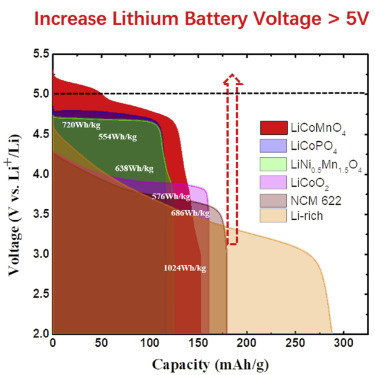 Researchers at the University of Maryland, Baltimore County (UMBC) have isolated a peptide, a type of biological molecule, which binds strongly to lithium manganese nickel oxide (LMNO), a material that can be used to make the cathode in high performance batteries. The peptide can latch onto nanosized particles of LMNO and connect them to conductive components of a battery electrode, improving the potential power and stability of the electrode. “Biology provides several tools for us to solve important problems,” said Evgenia Barannikova, a graduate student at UMBC. Barannikova works in the lab of Mark Allen and studies how biological molecules in general can improve the properties of inorganic materials in batteries. “By mimicking biological processes we can find the better solution,” she said. One of the problems currently facing battery researchers is the difficulty of working with nanoscale materials, which due to their extra tiny size can be hard to control and hold in place. The frustrations of working with nanosized materials are worth overcoming, however. 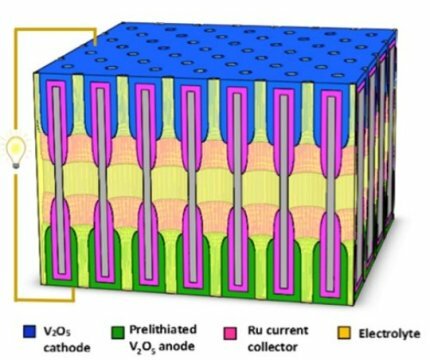 Nanostructured electrodes in Li-ion batteries have several advantages over bulk material electrodes, including shorter distances for charge-carrying particles to travel and a high surface area that provides more active sites for electrochemical reactions to occur — all of which translates to batteries that are lighter and longer-lasting. 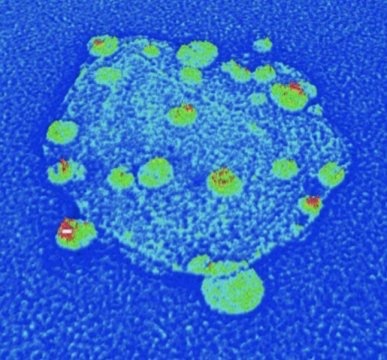 Barannikova and her colleagues used a procedure called “Phage Display” to screen more than one billion possible peptides in search of one that would stick strongly to lithium manganese nickel oxide. The “peptide library” through which the researchers searched is commercially produced by a laboratory supply company, and contains a vast number of randomly combined amino acid sequences incorporated into a protein made by a virus called the M13 bacteriophage. The researchers isolated a peptide that binds to lithium manganese nickel oxide by combining the library with a sample of the metal oxide and then repeatedly washing away the peptides that didn’t stick to it. The researchers then combined the newly-discovered peptide with a previously isolated peptide that binds to carbon nanotubes. Carbon nanotubes can serve as conductive nanowires in Li-ion electrodes. The team is currently testing how well the new cathodes perform. Going forward, Barannikova plans to make an anode with similar techniques and to integrate the two components. “I hope to demonstrate an entire biotemplated battery in my Ph.D. thesis,” she said. The above story is based on materials provided by Biophysical Society. Note: Materials may be edited for content and length. The University of Maryland (UMD) and the U.S. Department of Commerce’s National Institute of Standards and Technology (NIST) announced today the creation of the Joint Center for Quantum Information and Computer Science (QuICS), with the support and participation of the Research Directorate of the National Security Agency/Central Security Service (NSA/CSS). Scientists at the center will conduct basic research to understand how quantum systems can be effectively used to store, transport and process information. This new center complements the fundamental quantum research performed at the work of the Joint Quantum Institute (JQI), which was established in 2006 by UMD, NIST and the NSA. Focusing on one of JQI’s original objectives to fully understand quantum information, QuICS will bring together computer scientists—who have expertise in algorithm and computational complexity theory and computer architecture—with quantum information scientists and communications scientists. UMD and NIST have a shared history of collaboration and cooperation in education, research and public service. They have long cooperated in building collaborative research consortia and programs that have resulted in extensive personal, professional and institutional relationships. Dianne O’Leary, Distinguished University Professor Emerita in computer science at UMD, and Jacob Taylor, a NIST physicist and JQI Fellow, will serve as co-directors of the new center. Like the JQI, QuICS will be located on the UMD campus in College Park, Md. The capabilities of today’s embedded and high-performance computer architectures have limited advances in critical areas, such as modeling the physical world, improving sensors and securing communications. Quantum computing could enable us to break through some of these barriers. Establish a unique, interdisciplinary center for the interchange of ideas among computer scientists, physicists and quantum information researchers. Some of the topics QuICS researchers will initially examine include understanding how quantum mechanics informs computation and communication theories, determining what insights computer science can shed on quantum computing, investigating the consequences of quantum information theory for fundamental physics, and developing practical applications for theoretical advances in quantum computation and communication. QuICS is expected to train scientists for future industrial and academic opportunities and provide U.S. industry with cutting-edge research results. By combining the strengths of UMD and NIST, QuICS will become an international center for excellence in quantum computer and information science. QuICS will be the newest of 16 centers and labs within the University of Maryland Institute for Advanced Computer Studies (UMIACS). The center will bring together researchers from UMIACS; the UMD Departments of Physics and Computer Science; and the UMD Applied Mathematics & Statistics, and Scientific Computation program with NIST’s Information Technology and Physical Measurement laboratories. The University of Maryland is home to three quantum science research centers: the Joint Center for Quantum Information and Computer Science, the Joint Quantum Institute, and the Quantum Engineering Center. UMD has nation-leading computer science, physics and math departments, with particular strengths in the areas relevant to quantum science research. In the 2015 Best Graduate Schools ranking by U.S. News & World Report, UMD’s Department of Physics ranked 14th, the Department of Computer Science ranked 15th, and Department of Mathematics ranked 17th. The atomic/molecular/optical physics specialty ranked 6th, the quantum physics specialty ranked 8th, and the applied math specialty ranked 10th. Visit UMD’s website to learn more. As a non-regulatory agency of the U.S. Department of Commerce, NIST promotes U.S. innovation and industrial competitiveness by advancing measurement science, standards and technology in ways that enhance economic security and improve our quality of life. Visit NIST’s website for more information. If quantum computers are ever going to perform all those expected feats of code-breaking and number crunching, then their component qubits—tiny ephemeral quantum cells held in a superposition of internal states—will have to be protected from intervention by the outside world. In other words, decoherence, the loss of the qubits’ quantum integrity, has to be postponed. Now theoretical physicists at the Joint Quantum Institute (JQI) and the University of Maryland have done an important step forward to understand qubits in a real-world setup. In a new study they show, for the first time, that qubits can successfully exist in a so called topological superconductor material even in the presence of impurities in the material and strong interactions among participating electrons. To see how qubits can enter into their special coherence-protection program, courtesy of “Majorana particles,” an exotic form of excitation, some groundwork has to be laid. Most designs for qubits involve materials where quantum effects are important. In one such material, superconductors (SC), electrons pair up and can then enter into a large ensemble, a supercurrent, which flows through the material without suffering energy loss. Another material is a sandwich of semiconductors which support the quantum Hall effect (QHE). Here, very low temperatures and a powerful external magnetic field force electrons in a thin boundary layer to execute tiny cyclone motions (not exactly, but ok—also isn’t a cyclone a storm?). At the edge of these layers, the electrons, unable to trace out a complete circular path, will creep along the edge, where they constitute a net electrical current. One of the most interesting and useful facts about these electrons at the edge is that they move in one direction. They cannot scatter backwards no matter how many impurities (which in ordinary conductors can lead to energy dissipation) may be in the material. If, furthermore, the electrons can be oriented according to their spin—their intrinsic angular momentum—then we get what is called the quantum spin Hall effect (QSH). In this case all electrons with spin up will circulate around the material (at the edge) in one direction, while electrons with spin down will circulate around in the opposite direction. The QHE state is depicted in figure 1. In some materials the underlying magnetism of the nuclei in the atoms making of the material is so strong than no external magnet is needed to create the Hall effects. Mercury-cadmium-telluride compounds are examples of materials called topological insulators. Insulators (not sure how this sentence was supposed to start, but grammatically is currently confusing) because even as electrons move around the edge of the material with very little loss of energy, the interior of these 3-dimensional structures is an insulator; no current flows. The “topological” is a bit harder to explain. Partly the flow of current on the outside bespeaks of geometry: the electrons flow only at the edge and are unable (owing to quantum interactions) from scattering backwards if they meet an impediment. But topology in this case has more to do with the way in which the motion of the electrons in these materials are described in terms of “dispersion relations.” Just as waves of white light will be dispersed into a spectrum of colors when the waves strike the oblique side of a prism, so electron waves (electrons considered as quantum waves) will be “dispersed,” in the sense that electrons with the same energy might have different momenta, depending on how the electrons move through the material in question. The idea of electron dispersal is often depicted in the form of an energy-level diagram. In insulators (the left panel of Figure 2) electrons remain in a valence band; they don’t have enough energy to visit the conduction band of energies; hence the electrons do not move; the material is an insulator against electricity. In a conductor (middle part) the conduction and valence bands overlap. In the QHE (right panel) electrons in the interior of the material also do not move along; the bulk of the material is an insulator. But for electrons at the edge there is a chance for movement into the conduction band. Now for the topology: just as a coffee cup is equivalent to a donut topologically—either can be transformed into the other by stretching but not by any tearing—so here the valence band can be transformed into a conduction band (at least for edge states) no matter what impurities might be present in the underlying material. In other words, the “topological” nature of the material offers some protection for the flow of electrons against the otherwise-dissipating effects of impurities. The marvelous properties of superconductors and topological materials can be combined. If a one-dimensional topological specimen—a nanowire made from indium and arsenic—is draped across a superconductor (niobium, say) then the superconductivity can extend into the wire (proximity effect). And in this conjunction of materials, still another hotly-pursued effect can come into play. One last concept is needed here—Majorana particles—named for the Italian physicist Ettore Majorana, who predicted in 1937 the existence of a class of particle that would serve as its own antiparticle. Probably this object would not exist usefully in the form of a single real particle but would, rather, appear in a material as a quasiparticle, an ensemble excitation of many electrons. Some scientists believe that qubits made from Majorana pulses excited in topological materials (and benefitting from the same sort of topological protection that benefits, say, electrons in QHE materials) would be much more immune from decoherence than other qubits based on conventional particles. Specifically Sankar Das Sarma and his colleagues at the University of Maryland (JQI and the Condensed Matter Theory Center) predicted that Majorana particles would appear in topological quantum nanowires. In fact part of the Majorana excitation would appear at both ends of the wire. These predictions were borne out. It is precisely the separation of these two parts (each of which constitutes a sort of “half electron”) that confers some of the anticipated coherence-protection: a qubit made of that Majorana excitation would not be disrupted by merely a local irregularity in the wire. A recent experiment in Holland provides preliminary evidence for exactly this occurrence (***). One of the authors of the new study, Alejandro Lobos, said that the earlier Maryland prediction, useful as it was, was still somewhat idealistic in that it didn’t fully grapple with the presence of impurities, a fact of life which all engineers of actual computers must confront. This is what the new paper, which appears in the journal Physical Review Letters, addresses. The problem of impurities or defects (which flowing electrons encounter as a form of disorder) is especially important for components which are two or even one dimensional in nature. The same is true for the repulsive force among electrons. “In 3-dimensional materials,” said Lobos, “electrons (and their screening clouds of surrounding holes) can avoid each other thanks to the availability of space. They can just go around each other. In 1-D materials, this is not possible, since electrons cannot pass each other. In 1D, if one electron wants to move, it has to move all the other electrons! This ensures that excitations in a 1D metal are necessarily collective, as opposed to the single-particle excitations existing in a 3D metal.